If the legacy of a Victorian Christmas is a celebration of domesticity with a flavour of charity, Luke’s Christmas is altogether an edgier and hard-hitting affair. Gabriel tells her that she will be the mother of the long-promised Messiah: God’s annointed son; a king in the line of David whose kingdom will never end; a saviour of Israel; born through the power of the Spirit of God. The context of course is centuries of occupation, oppression, violence, rebellion by various empires that had culminated in the Roman’s annexation of Palestine in 63 BC. Client kings and a Roman Procurator ruled with iron fists. taxation was crippling, religious freedoms were heavily constrained. Mary’s experience is as a young Jewish peasant girl growing up under foreign Empire and, like her co-religionists, longing for a better day when the blessing of God would revisit his chosen people. And so in her Magnificat, politics and faith are intertwined. She praises God, for in her ‘humble state’ he, the almighty one, has stooped down to intervene. And what an intervention. She above all women has been chosen to bear the Messiah. She acknowledges the power of God; the proud are scattered, rulers like Caesar are brought down from their thrones. Mary is singing of political revolution. The rich will be sent away empty, the humble and hungry will be lifted up and fed. Mary is singing of social revolution. She celebrates that God is faithful; he has kept his promise to Abraham and therefore to Israel. Their saviour is coming. The saviour is not, as was routinely claimed in those days, the Emperor Caesar Augustus – the ‘saviour’ bringing peace, stability and civilisation to the known world. Mary sings of a far greater saviour. Mary is singing of spiritual revolution. What happens next confirms how God’s kingdom and the Empire of Rome begin to clash. Jesus is born in Bethlehem, away from family and support structures, due to the edict of a distant Emperor demanding a census. Matthew tells of how the birth precipitates brutal bloodshed as Herod attempts to eradicate a possible political threat. He also tells of Mary, her child and Joseph becoming political refugees, seeking asylum in Egypt. At each step Mary experiences the political, social and spiritual consequences of being chosen to bring the Messiah into the world. This Christmas account is a long way from a cosy, private domesticity that leaves the wider world pretty well as it is. Rather it’s a tale proclaiming that the greatest power structures in existence are being radically reconfigured. Things will never be the same again. A new king is coming. God is not far off. He is alive and active and present in the midst of oppression and injustice. A new kingdom is arriving. This second Christmas tale leaves us with questions about how we understand the world, who is in charge and where is it going. It points us way beyond a myopic focus on ourselves and our families to a much bigger picture. It calls us, like Mary, to celebrate the redemptive actions of the living God. What words and associations come to mind with this picture I wonder? It’s the cat I like most. A picture of utter relaxation and comfort; laid out infront of the cosy fire, truly at home. The surrounding presents, well decorated tree, and expectant santa socks all speak of secure family domesticity. All is well in this picture. The image captures for me our culture’s ideal of Christmas. 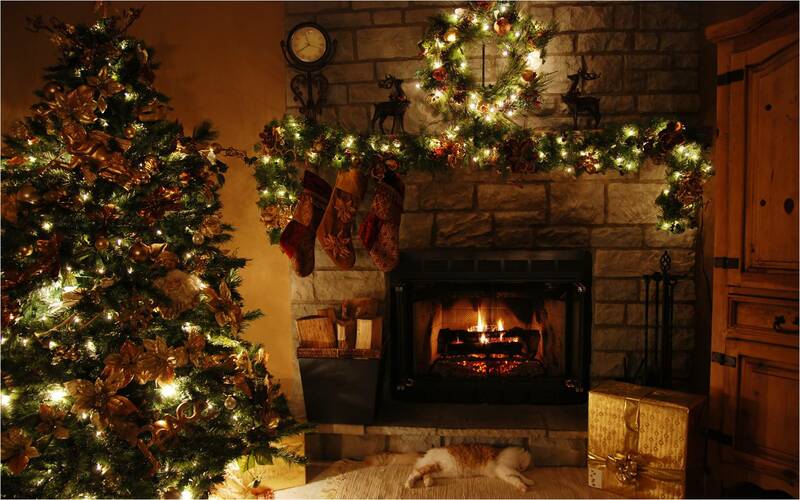 Centered on the home, Christmas is a time for rest, relaxation, but most of all it’s a domestic festival centered on the family. It’s a time to retreat to the home castle, shut out the world, and enjoy the company of our nearest and dearest. Of course this works perfectly well for many. But it isn’t such an attractive proposition if you don’t happen to have a family, or are far from home, or if the idea of spending several days in uninterrupted company with your closest relatives fills you with dread! 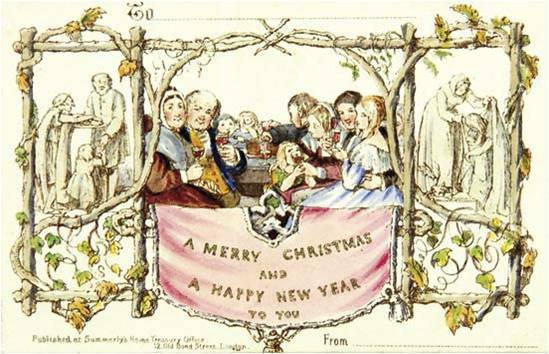 Here’s another image – this time of the first Christmas card, send in 1843. Here is the Victorian ideal that continues to shape contemporary notions of Christmas. A large prosperous family enjoying seasonal fare in their own contented company. The side panels speak of an awareness that such blessing should not be taken for granted. Christmas happiness should be shared with those less fortunate – so the acts of charity to those who do not belong in the centre panel. 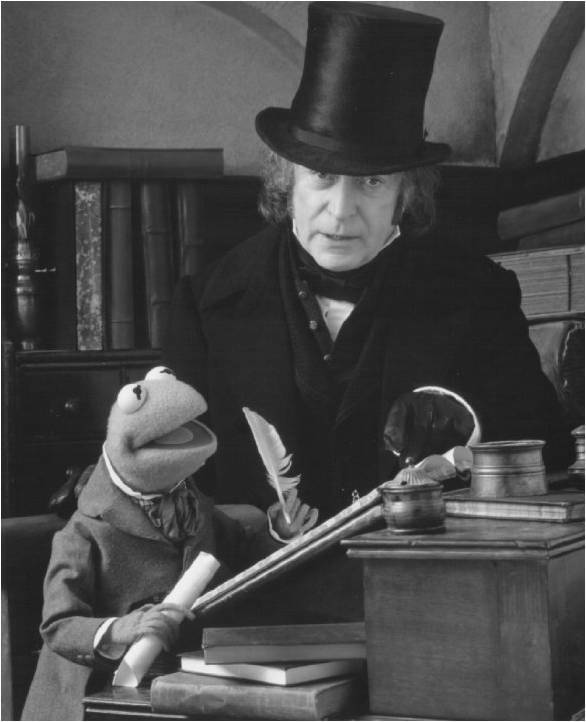 And a third image of a great movie – the Muppet Christmas Carol with Michael Caine. Dickens’ morality tale encapsulates Victorian idealism around Christmas. Scrooge’s heart is turned from stone to flesh so that he, the ruthless businessman, would see that Christmas is all about charity, compassion and care for others in need. There is more to life than capital. And it is in turning to look outward rather than selfishly inward that Scrooge is saved from himself. I love this story – but as Clint Eastwood never said, ‘a story has gotta know its limitations’. The Victorian ideal has much truth and value in it. Christmas can be a fine time to enjoy family, domesticity and to retreat for while from the incessant clamour of work. It is a good thing at the same time to think of others in need and give generously. And the enduring influence the Victorian Christmas is seen in how Christmas is a time to give to charities or do charitable things – like make up a shoebox of goodies for children in the developing world. But this Victorian tale of a domestic Christmas is, on its own, a severely limited one. It is comfortable with the status quo for one thing. Yes Scrooge is moved to pay a fair wage, but the question of whether there are unjust social and political structures trapping Bob Cratchit in a vicious cycle of poverty isn’t addressed. OK, those needing charity are helped – but in a one-off paternalistic sort of way that does not filter through to consistent long-term action to help people help themselves. The poor and unfortunate remain on the side panels of the Christmas card – they aren’t about to get invited in to join the private family feast going on in the middle. We need another Christmas tale, beyond an idealised, stifling and claustrophobic domesticity. The radical Dr Luke provides one (next post). This post links in a totally unplanned way from the exegetical discussion of NT gifts to the contemporary question of how the heck what is described so routinely in the NT is to be ‘applied’ to contemporary church life. I’ve been aware but pretty uninterested in the internet kerfuffle started by John McArthur’s Strange Fire conference. However, it has sparked a couple of interesting reflections on this side of the Atlantic – in Britain anyway if not in Ireland. Both are by ‘Reformed charismatics’ – which in itself is an interesting combination. All of which is to say that I suspect that an engagement between ‘charismatic’ and ‘cessationist’ evangelicals which is attentive to the lived reality of faith will turn less on confessions of belief about supernatural gifts, and more on debates about the place of spontaneity in worship, and about the effectiveness of crisis moments in sanctification and about the right ways to work out vocation. I was happily a member of a charismatic Baptist church in England for some years and I think this sounds sounds right. Being ‘charismatic’ there was more about a style or ethos around worship, prayer, immediacy of the presennce of God in ministry and so on than it was about how exactly some spiritual gifts were (or were not) practiced. But if you think ‘evangelical’ is hard to pin down, this also highlights just how slippery the term ‘charismatic’ is. Holmes’ description is pretty subjective stuff. I also read the team written Think Theology blog. Andrew Wilson, New Frontiers pastor and excellent blogger (even if he has yet to see the light on women in ministry) has a comprehensive and thoughtful post here. What struck me reading it was his 5th point and the phrase (borrowed from Tim Keller) the ‘mushy middle’. The mushy middle is an abstract form of charismatic belief. Those who in theory believe in in the continuation of all the gifts today but in practice are pretty well indistingushable from cessationists. Would someone like John Stott, with his ‘open but cautious’ view have fitted here I wonder? The mushy middle sees NO exegetical and theological reason NOT to believe in the continuation of all the gifts described in the NT, but neither do they see any great reason to upset the status quo by getting all hot and bothered about the actual practice of those gifts. For, to be blunt, they could be more trouble than they are worth. There are more important priorities. If they show up fine, but let sleeping dogs lie if not. I’ll be honest here and say the term ‘abstract charismatic’ probably describes me pretty well. While I’m not fully persuaded by his argument (will come back to this in another post) what he says is challenging and thought-provoking. An overdue return to pick up Anthony Thiselton’s discussion of the gifts of the Spirit. He’d left remaining gifts in 1 Cor 12:9-10 (stuff like deeds of power, prophets, tongues, healing) to a separate discussion since he says they involve not only exegesis but hermeneutics, the result of the latter being radically different contemporary interpretations. In other words, this is the more controversial stuff. So an opening question – have you had experience – positive or negative of these sorts of gifts? What place do they have in your theology and church practice? Is there a place for these or are they in effect ignored? And if so, why? Plural. Paul does not use normal Greek word of therapeuō. Only refs healing in 1 Cor 12:9, 28, 30. Thiselton warns of damaging mis-application here. Healing is not guaranteed. Paul is not healed of this ‘thorn’ (2 Cor 12:8). The danger is the implication that healing is ‘caused’ by our faith. Such a theology can make things worse. Why was not my faith good enough? Why does God refuse my sincere prayers? He proposes these gifts include normal natural cures as well as direct ‘intervention’ from God beyond the natural. A gift is from God – it is as he wills. All things are possible for God, he is not limited to natural or ‘supernatural’. All are gifts of grace. He argues for a balanced eschatology: neither totally realised eschatology or all future in Paul. He mentions often exaggerated claims of healing in Renewal and Pentecostal practice. This comes out of a dualistic and over-realised eschatology. Such claims often do not match reality – neither are they the same order of power or experience as the NT. In the overlap of the ages, sickness and sin and death are still present. BUT he also acknowledges (rightly) that Paul expected healing; not automatic healing but there is also no hint of cessationist thinking in Paul. Some debate what this refers to: Thiselton argues ‘effective power’ is a better translation than ‘miracles’. Here is the tension of Christian life and its relationship with power. Power to do what? Thiselton suggests power to work wonders; power to carry out tasks; power as a resource; power to convey thoughts and speech; power to work miracles? Sense of being competent and equipped. Keener’s magum opus on Miracles (2011) offers a profound challenge to an often assumed naturalism within much western Christianity. Paul ‘anticipated noticeable miraculous phenomena in the Christian communities (1 Cor 12:9, 28-30; Gal 3:5).’ (pp 30-31 of Keener). Thiselton says the text is not clear on whether miracles are primarily in focus in this gift but neither does he deny their reality. But he does question the idea of pervasive miracle working. In this, he echoes John Stott (Baptism and Fullness) who pointed to the wide expanses of the biblical record with little or no miraculous activity. Rom 12:6; 1 Cor 12:10; 13:2; 14:6; 1 Thes 5:20, cf 1 Tim 4:14. And the verb to prophesy prophēteuō is in 1 Cor 11:4, 5; 13:9; 14:1, 3-5, 24, 31, 39. Always to build up the body. Some link it to Paul’s apostolic role of leading, preaching, teaching. A spontaneous word to the people from God? Dunn argues this – the Early Church exuded a sense of the Spirit, later institutionalised and controlled. [Thiselton includes Max Turner as agreeing with Dunn but quotes from a 1985 article. 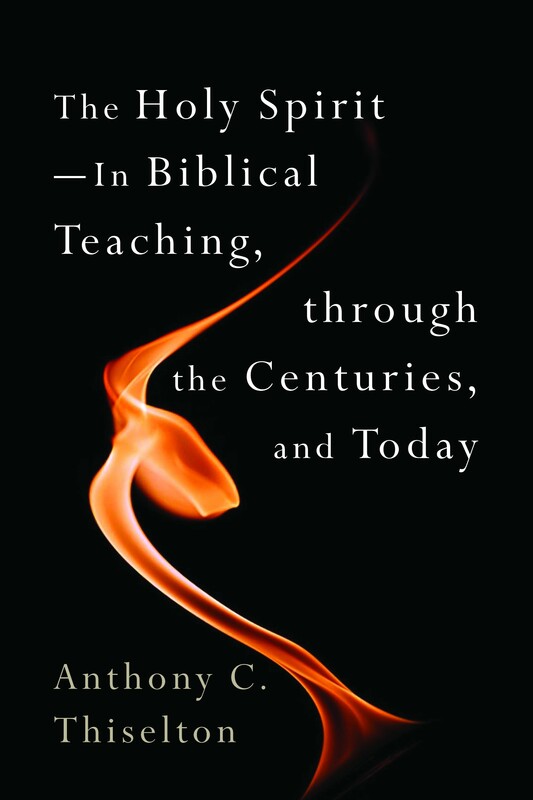 Turner argues against Dunn in his more recent The Holy Spirit and Spiritual Gifts]. This remains much debated. Gordon Fee would differ from Thiselton’s emphasis here – more a supernatural revelatory word from God. Certainly not just ‘preaching’. However understood, such a ‘word’ is not beyond question. Others are to weigh the prophecy. The word is to engage the mind, it encourages and consoles, it is not private but corporate (1 Thes 5:20 and Rom 12:6). It happens in the context of whole community; intelligibility is necessary (1 Cor 14:1) and links to gospel of God for the whole church. There are ‘kinds’ of tongues in 1 Cor 12:10 but in 1 Cor 14:2 the tongue does NOT speak to others but only to God (distinct from Acts 2). Certainly the context is building up and encouraging the self – a good thing to do. Nothing negative about this gift of the Spirit, he gives good gifts. But the gift of tongues has limits; it does not build up others. Private use in 1 Cor 14:6-19. These tongues cannot be understood by the hearer or naturally. The gospel is preached in the vernacular. 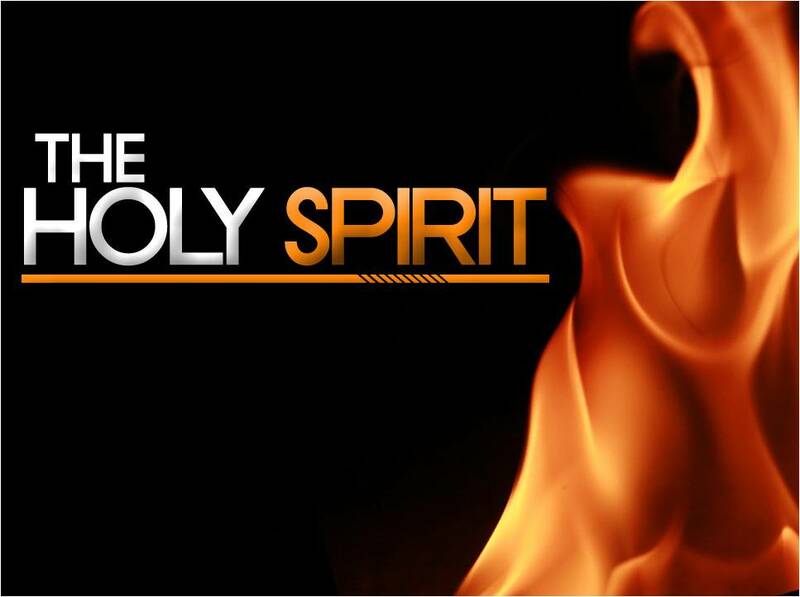 Tongues is more a sign that the church has been empowered by the Spirit. So what is tongues? Thiselton mentions linguistic experts who find no structure of a formal language – more a façade of a language. Some see it as ecstatic speech. Thiselton rejects the idea of angelic speech. He’s sympathetic to a parallel to Romans’ 8:26 talk of “sighs too deep for words” – do tongues represent a release of praise and worship of God beyond words ?